Apple has released iOS 6 software update over the old version iOS 5 includes more than 200 new feature. The new update promises some improvement but it certainly comes with large file sizes. Apple updates iTunes Store over the year and is offered with both. 6 new IOS Software Update iPhone 4S, iPhone 4, iPhone 3 GS, iPad 2, new iPad, fourth-generation iPod touch and fifth generation iPod Touch is made. File size is different for each device. 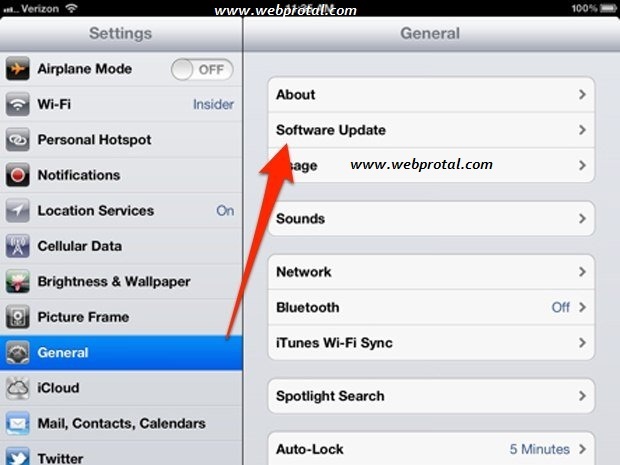 6 The IOS software updates to download and install one of these two methods and you can do the follow. Opened on your iOS device's settings and list Application select the General option. Then make sure they are connected to WiFi networks IOS device. Select Software Update from the menu and the Check IOS device to update to 6. Download the updated IOS 6 to start the process to select download and install. 6 Once the update has been downloaded to iOS, it will only install the iOS device will have enough battery life. The second method - using Mac and PC. The latest Apple iTunes 10.7 on your Mac and PC desktop software to download and install. IOS Update before downloading, iTunes to back you ask about the device connected and you are expected to select the appropriate setting. Once the backup is complete, itunes iOS 6 update will download and then be sure to install it on your device. Please note that updates on PC or Mac download size is larger because of which the OTA will end.